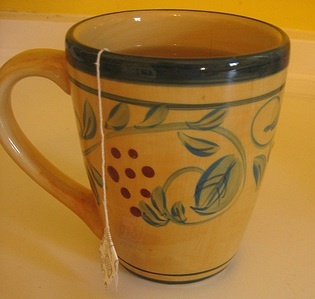 Green tea's recent rise in popularity--the newest, the latest, the greatest? Can this pale beverage from the Eastern World do all it is reported to do? You may have read claims of weight loss, cancer prevention, lowered heart disease risk and lowered cholesterol. This form of tea is considered to be antiinflammatory, antioxidative, antimutagenic, and anticarcinogenic, and can prevent cardiac disorders. Here's a typical opinion from kelsc27, author of "green tea baby" article at ProgressiveU: "Green tea does contain less caffeine then coffee. But does contain two substances that are alike caffeine. One of the substances, theophylline, is stronger then caffeine. And the other substance, theobromine, is weaker than caffeine. But all those combined makes for a longer and healthier energy surge than coffee. You don’t fall as much as you do after coffee." In browsing through research articles and blogs, I found facts and figures, as well as opinions and personal experiences. To simplify for you, I've laid out first the facts--that's why this is under the Research section!--and left my personal experience at the end of the page. Worth my time to drink? After hearing people's stories of the tea affecting their type 2 diabetes, a curious thing happened. Doctors, pharmacologists and medical researchers in both China and Japan closely examined the effects of green tea on the blood. The chart above shows the effect on blood sugar of human test subjects. Wow. Just for fun, here are some less important benefits: grow strong nails and hair, stop bad breath, calm certain stomach ailments. ...The manufacturing process of green tea differs from that of black tea because freshly picked young leaves of the tea are immediately steamed. This process destroys the enzymes responsible for breaking down the color pigments in the leaves and allows the tea to maintain its green color during the subsequent rolling and drying processes. Viola! 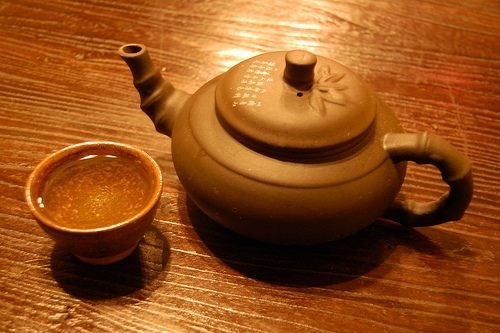 The amounts of health-boosting compounds now vary slightly from those of black tea. What's left in the green? Polyphenols--an antioxidant that prevents damage to wholesome cells as well as reduce and eliminate cancer cells. Catechine--cleans out alkyl peroxl radicals. Flavonoids--which dilate the lining of the blood vessels, keeping them pliable. 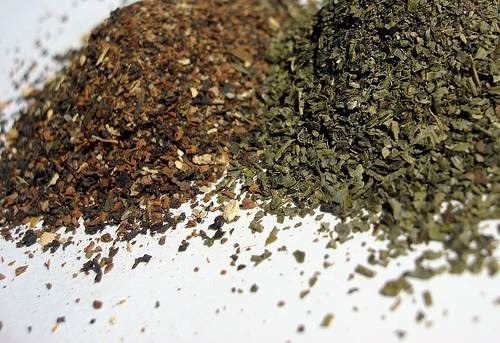 Compare these chai tea leaves on left to the green ones on the right. You can see the difference steaming first makes. "We found very promptly [that] after drinking green tea, there was a protective effect on the endothelium (lining of blood vessels)," says Dr. Charalambos Vlachopoulos, cardiologist and study author. In the form of lowered cholesterol and blood pressure, relaxed blood vessel walls, insulin response improvement, destruction of cancerous cells, etc. The best study I've come across took place at Toyama Medical and Pharmaceutical University in Toyama, Japan, and China Medical College, Taichung, Taiwan Republic of China. If you would like to read the full text, click on the photo link above that is a chart of their June 2004 findings. 6g (Six grams) per day is all you need to relax those blood vessels and stave off cancer and diabetes. That's 4 - 5 cups of the light stuff; and the lighter the better. Remember, steam, don't boil, and you'll reap greater health benefits! As promised, I've left my personal experience for last. It began November 1st, 2007, when a routine blood work-up showed a total cholesterol level of 219. What a surprise that was! My practitioner wasn't very concerned, and prescribed no medicine. So, I changed only one thing--ate less butter. (That was hard!) I neither increased nor decreased my exercise habits. At a follow-up blood test in April 2008, total cholesterol had climbed to 230. Now I began to take action: I took a daily green tea supplement and added drinking a half-pot of the pale stuff a couple times a week. If you would like to try the same supplement, simply click on the underlined words in the previous sentence, and it'll open a page on my colleague's site that lists the supplement (cholesterol health)! Retest in September 2008: cholesterol = 200! Well, that convinces me: I'm drinking the tea. This inspires me to ask--Do you have a green tea story to share? I'd love to hear it! ...and perhaps you'd let me share it?